Okay, back to the food! 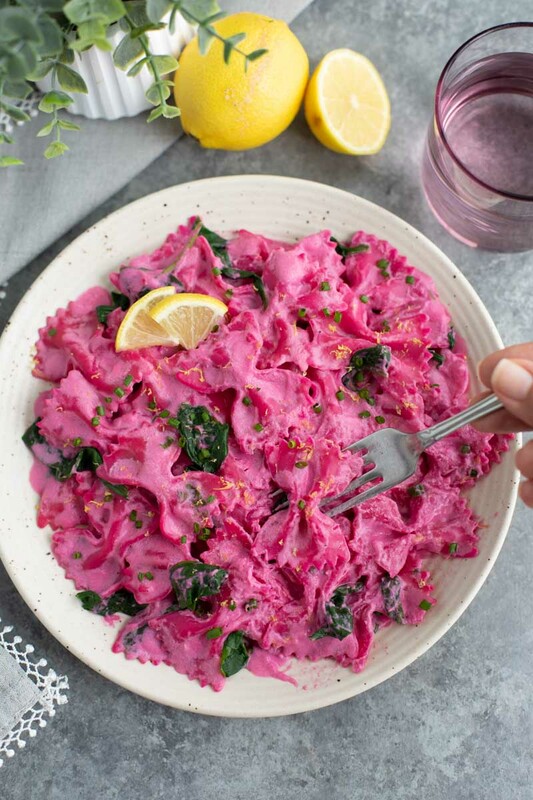 I actually made this vegan beet pasta sauce on Valentine’s Day because of its lovely fuchsia color, but it’s also perfect for a light and healthy spring or summer meal. I always try to come up with foods that match the holiday or season, I get this from my mom. When I was little, my mom always made us heart shaped pancakes with a cold glass of pink strawberry milk for Valentine’s Day breakfast! It was the besttt! 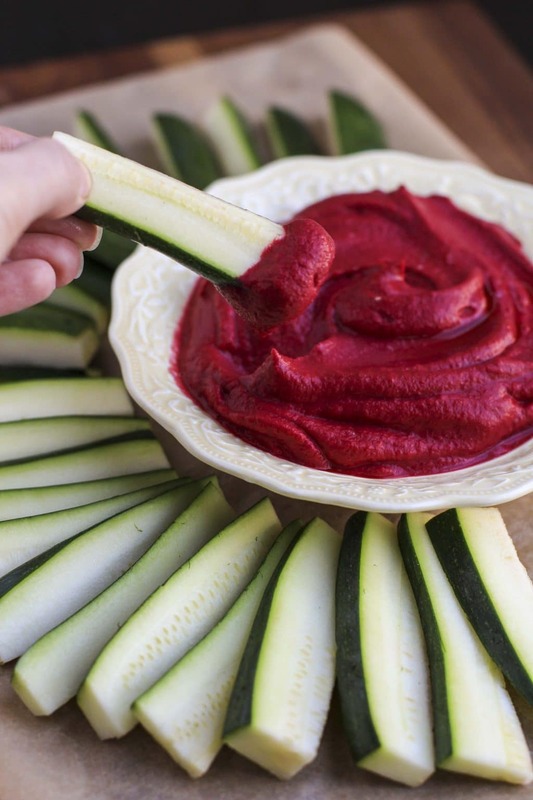 I make beet hummus for a healthy snack quite often and the color of the hummus gave me the inspiration to try the roasted beets blended with cashews and veggie broth to create a truly flavorful and delicious sauce! The best part is that the color is natural, nothing artificial in this colorful recipe! I love making brightly colored recipes at home, it just seems like the brighter the food, the better it is for you. Naturally bright foods, of course. 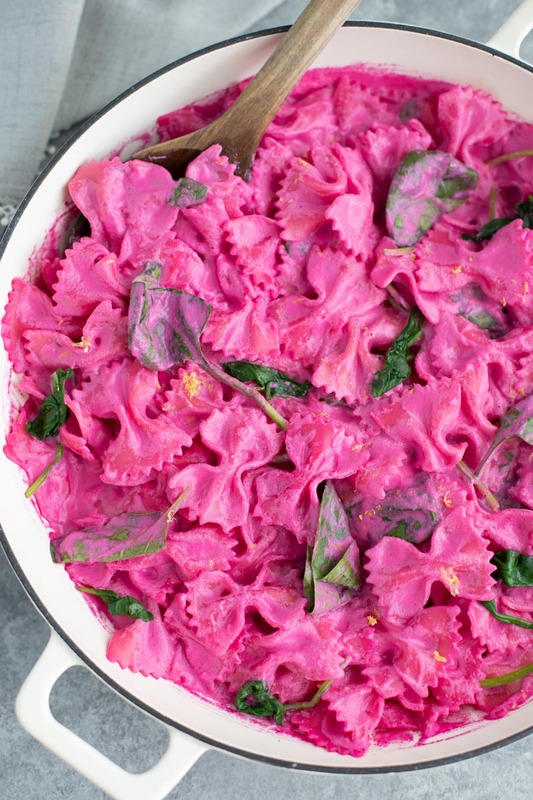 What Does Vegan Beet Pasta Sauce Taste Like? Travis loved it too! He described it as creamy and tangy and said it was such a cool color! He was shocked to see that the noodles started out white but turned bright pink after I mixed in the sauce. The noodles weren’t just coated in the sauce, they absorbed the sauce and the color! Have You Tried Nut Cheese Yet? You all know that I try to keep dairy out of our diet so I was super pumped to find a new type of “cheese” at the grocery store —> Miyokos double cream sun-dried tomato garlic “cheese” that’s made from cashews! I was a little skeptical at first but then I remembered that I love using cashews for sauces and dressings so I figured it would be just as creamy and delicious in cheese. I was right, I’m so glad I tried it! I don’t know how they do it but it’s so smooth and creamy and it really gave me the sensation that I was eating real cheese! 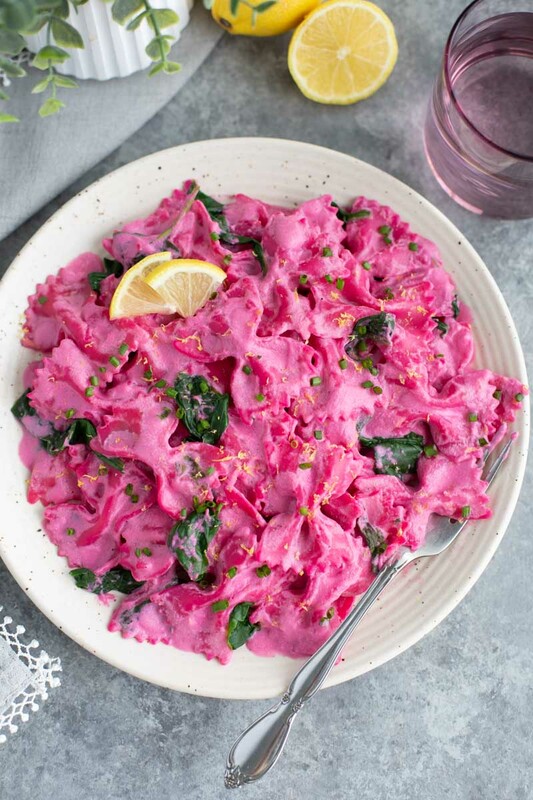 When I served the vegan beet pasta, I added dollops of the cashew cheese all over the top and let it melt into all the nooks and crannies of our favorite twisty noodles. So decadent! Note – If you’re not dairy-free, crumbled goat cheese would be delicious with this pasta dish! Drizzle olive oil over and salt on each beet. Cover with parchment or foil and roast for one hour. Remove the beets from the oven and let cool until you can handle them without burning yourself. Use a paper towel to carefully peel off the skin. Add the cooled roasted beet, cashews, lemon juice, garlic powder, vegetable broth, salt, and pepper to a high powered blender. Blend on high until the sauce is smooth and creamy. Set aside. In a large saute pan, saute the onion in olive oil for 5-8 minutes, or until translucent. Add the frozen spinach and cook until fully defrosted. Season with salt and pepper. In a separate pot, boil salted water and cook your noodles of choice. Once the noodles are cooked, drain the water (reserve 1/2 a cup in case you want to thin the sauce) and pour the noodles into the pan with the spinach and onions. Pour the beet sauce over the noodles and stir to coat everything evenly. Top the pasta with dollops of cashew cheese and sliced green onions. If you make this vegan beet pasta sauce for dinner and post a picture on Instagram, please tag me using the hashtag #StaceyHomemaker so I can see your delicious creation! Want to start your own healthy food blog and share all of your delicious recipes? Learn how to do it in just 3 easy steps + check out the 10 tools that all new bloggers need to be successful! What’s your favorite way to cook with beets? Let me know in the comments!